This section belongs with my description of Lucca in an earlier post, but I forgot to place it there. San Martino church houses the wooden sculpture of Jesus shown in the photograph at left, which is entitled Il Volto Santo (The Holy Face). According to legend, the body was carved by Nicodemus, and the face was carved by angels. Thus, it is the only work of art to show the true face of Christ. Many relics have legends associated with them, but this image of Jesus is unlike any I had ever seen from Europe or America until recent decades. Jesus is not a Caucasian; here he is shown with dark skin and non-European facial features. In reality, Jesus was an ancient Jew. I was stunned to find this sculpture amidst many examples of the fair skinned tall man with beautiful hair often depicted in Western art. 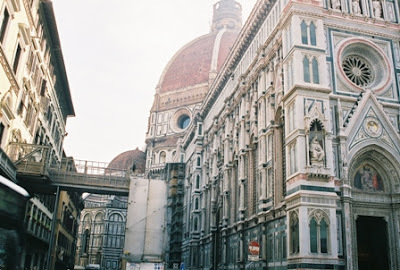 Florence is only an hour away from Pisa by train. The workshop ended Friday morning, and I took the train to Florence on Friday afternoon. Rossi with little difficulty. 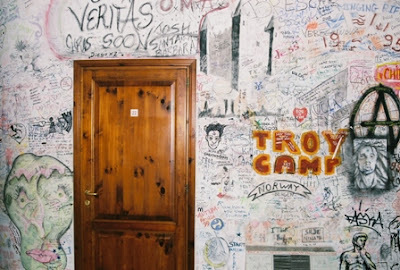 The hostel is quite a unique place; most of the walls are covered with graffiti. Some of it is vulgar, but some is remarkably good. The picture at left shows the view from my hostel window. It looks out over a narrow street within walking distance of the main attractions in the old city center. 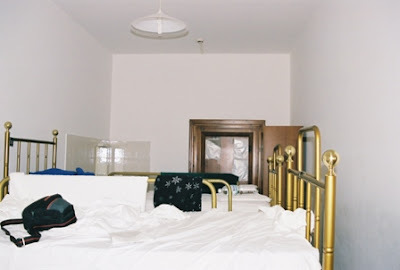 The interior of the room is shown below. Here is the graffiti surrounding the door to the room in which I stayed. 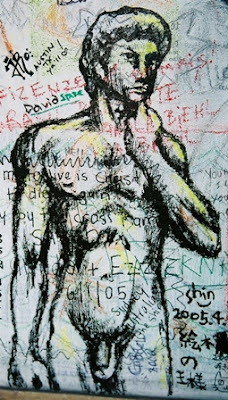 On the lower right in the photograph above, you can see the upper torso and head of a man in a drawing. Closer examination revealed that this is King David. 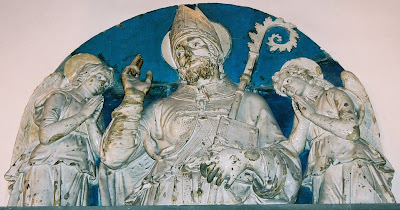 In addition to visitors from many nations, the hostel was populated with several copies of sculptures, such as the one depicting the cute couple below at right. 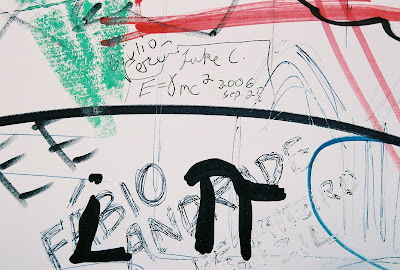 My favorite piece of graffiti is the equation below. It is correct and relates five important constants in one equation. One can enter the cathedral by purchasing a ticket or attending mass, since this is still a functioning Roman Catholic church. On Saturday evenings, a mass is held in English, and I was able to attend one while I was in Florence. The interior was as beautiful as the exterior but not very well lit. Of course, photography was prohibited during the mass, and I do not remember even bringing my camera along. The mass began a few minutes late because the priest was stuck in traffic! When he arrived, we discovered that he was Mexican. He delivered a homily in English to a congregation in an Italian cathedral; this was a truly international experience. His homily was very good; he spoke about how the humanity of Jesus and the imperfections of his disciples lend credibility to the stories recorded in the four Gospels. 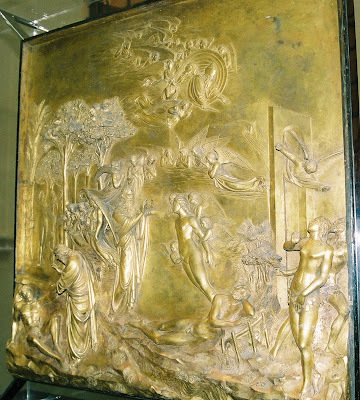 This is one of the bronze panels that constitute the side doors on the Cathedral baptistery. The doors are contain exquisite detail; the artist took decades to make them. As far as I can tell, this panel depicts the story of the woman caught in adultery. 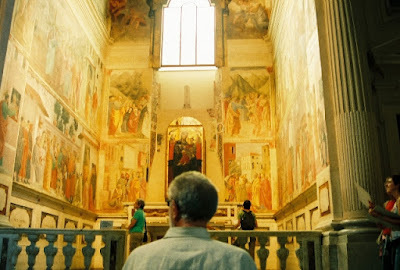 As with the other cathedrals in Italy, most of the surface of the church is covered in artwork. Much of the art on the outside is not original; instead, it has replaced by copies and moved into the Duomo Museum to protect it from exposure to weather and pollution. 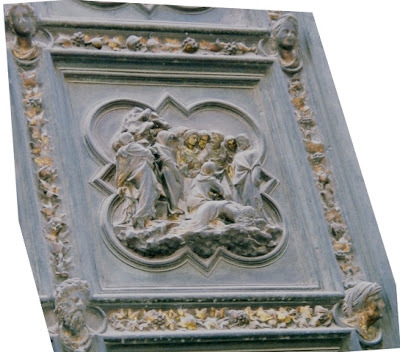 The beautiful and dazzlingly intricate bronze panel above was originally part of the bronze front doors on the baptistery. These doors consist of ten panels depicting stories from the Old Testament. The originals are under glass in the museum after a painstaking effort to restore them following damage suffered when Florence was flooded in 1966. The panel above tells the story of Adam and Eve. On the lower left, God is forming Adam out of the ground. In the middle, near the bottom, Adam is asleep with his head laying on his arm. Angels are lifting Eve directly out of Adam’s body to face God. Apparently, she came from one of the ribs in Adam’s back; her feet may still be embedded in his body. 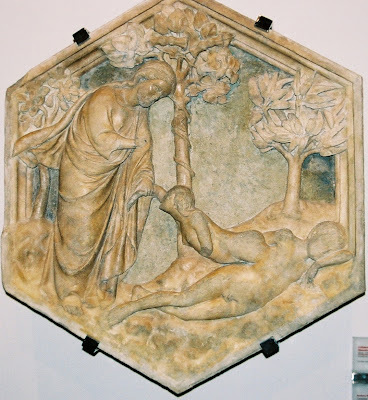 Below, one of the panels from the Bell Tower depicts the creation of Eve in a similar way. This time, God is using one of Adam’s front ribs, and most of her legs are still inside of his body. I had never before seen the creation of Eve represented in this way. I had always imagined God removing the rib, taking it elsewhere, and forming Eve around it. I found this form quite beautiful and heartwarming. Eve’s extraction in these images seems like a reversal of normal birth. Adam seems to be giving birth to a full-grown Eve. Even the obscure Biblical character Jubal has a panel on the Bell tower. As you may be able to tell from the couple in her right hand, this diamond-shaped panel represents Venus, the Roman goddess of love. 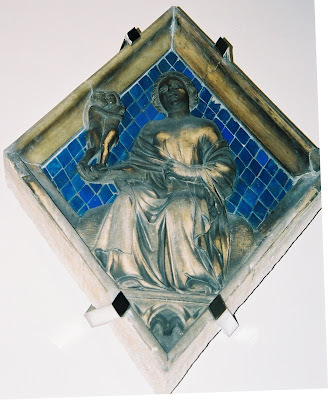 A pagan goddess on the bell tower of a Christian cathedral may seem misplaced, but according to the signs posted throughout the museum, the inclusion of pagan and classical had a fascinating purpose. The commissioners of this artwork took believed that all things could bring glory to God. Even the classical pagan myths could point people to the true God. 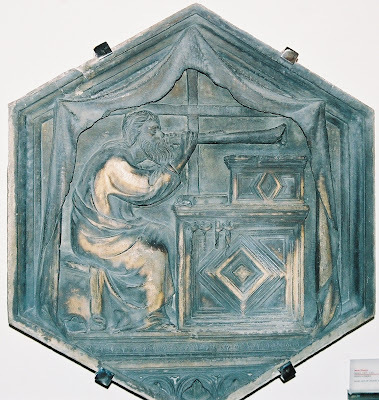 I am not sure if I agree, but the panel below represents another such pointer; it is the personification of Astronomy. They believed the observation and understanding nature, which developed into science, could also bring worship and glory to God. I pray that such sentiments would be more strongly present in the American Christian Church. The art of music was also on display in the museum. 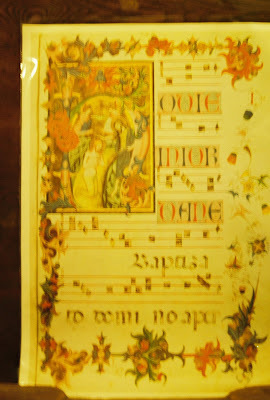 This is an illuminated manuscript of sheet music. The text is in Latin, and the notes were written before musical clefs had been invented. I am not sure if I could play it. Below is an example of a sculpture medium that was a bright departure from all others I had seen in Italy. The medium is terra cotta with an enamel glaze. The white enamel reflects much more light than marble, bronze, or wooden sculptures. It must have done much to brighten a church’s interior before the introduction of electric lights. 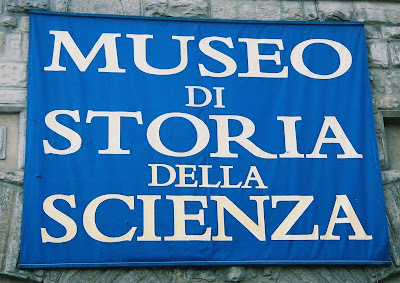 The History of Science Museum in Florence continued the Galileo theme. The museum did not allow photography, and I could find no postcards of my favorite exhibits, so this image of the sign on the outside is the only image I have. The museum is fairly large, but its two most prized artifacts belonged to Galileo. Both are held in elaborate cases. The first artifact is the primary lens of the telescope he used to discover the four largest moons of Jupiter; these were the first objects found that did not appear to orbit around Earth. It was a small lens not much larger than a US dollar coin, but with it, he made one of the most important discoveries in scientific history. The second artifact is his right middle finger; it is held in a glass reliquary shaped like an egg. It is brown and extremely desiccated. Even science has its relics. This is Santa Croce (Holy Cross) Cathedral. I could not back far enough away to capture the whole front of the building in one frame. 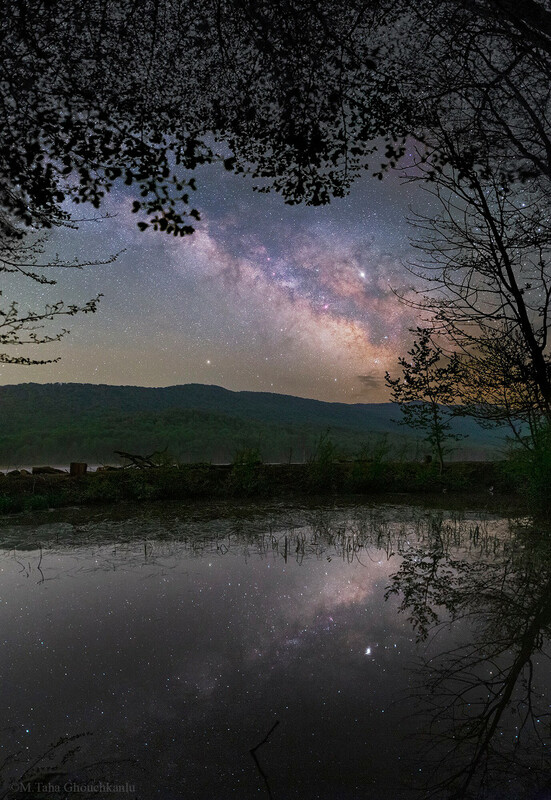 This happened often on my trip; I hope to buy a wide angle lens if I ever return. The stature at the lower left is of Dante, who wrote The Divine Comedy, part of which is his most famous work, The Inferno. He is one of many famous Italians honored in and around this imposing structure. 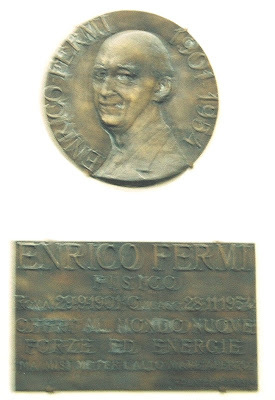 Enrico Fermi. I think his body, and those of the physicists described below, is actually buried beneath the floor inside the cathedral. I know the photograph is a bit blurry, but no flash photography was allowed. 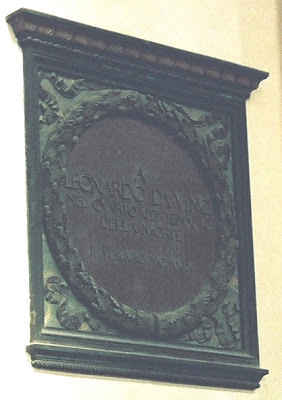 I realize that Leonardo Da Vinci is know more for his art than his scientific investigations, I think they do merit his grave’s place along side many of the best scientists of any century. I did not realize his grave or Fermi’s or Marconi’s (see below) would be here. This was a very pleasant surprise. 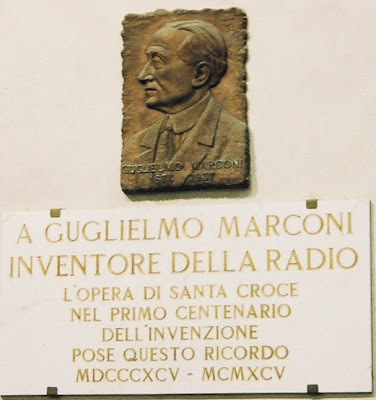 Above, we have the grave of Marconi, inventor of the radio. 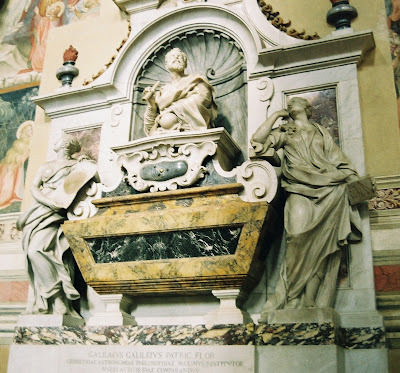 This magnificent funerary monument belongs to Galileo, whose body was transferred here from an obscure cemetery many decades after his death. You can see two of his major discoveries memorialized in the monument. 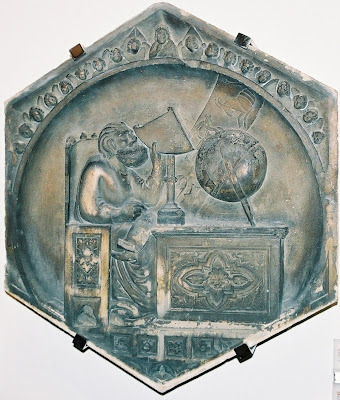 The four moons of Jupiter are visible below his bust, and the sculpted woman on the right is holding a tablet depicting some of his discoveries regarding gravity. As I wrote to my adviser in a postcard, this is how I would like to be memorialized someday! Symbolically located directly across the sanctuary from Galileo is the grave of the great Renaissance artist Michelangelo. According to one of the tour guides in the cathedral, he died the day that Galileo was born. Again, the arts and sciences can work together to glorify the Lord. Above is the Brancacci Chapel, which is covered in murals depicting the life of St. Peter. These murals are remarkable because they were among the first to use the rules of perspective. They posses a depth and covey a sense of volume that I found in few other works I saw in Italy. This was the only good photograph I took because no flash was allowed. The above mural, which is a photograph taken from the World Wide Web, shows Peter healing the sick with his shadow. Notice the way the lines are not parallel to the edges of the painting. They receed toward each other as such lines do in real life; this gives the illusion of depth, volume, and the third dimension that I mentioned earlier. 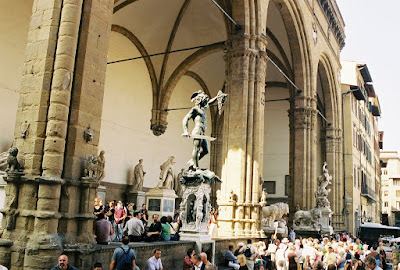 The Uffizi is the most famous museum in Florence. It contains a huge collection of artwork that was amassed by the ruling Medici family of Florence during the zenith of their power. No photography was allowed inside the Uffizi, so all the photographs below are courtesy of the World Wide Web. 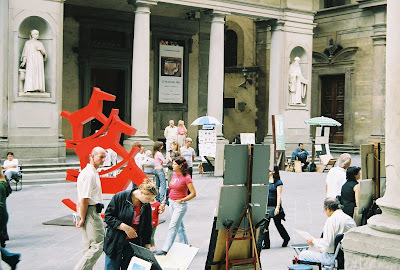 The photograph above shows the museum’s courtyard, which is populated by street artists, statues, and street artists dressed like statues. I waited in line for about two hours before entering. By the time I entered, only about two hours remained before the museum closed. I wish I would have had more time. The Uffizi is shaped like a U, with the courtyard inside the U. The interior consists two floors. Each has a single hallway lined with various rooms full of paintings and sculptures. Among them, as you can see above, were busts of ancient Roman emperors. The bust of Nero, of which I did not find a good picture, possessed a very smug smirk. You may think this is odd, but I was offended by that smirk and whispered to the bust, “You lost.” The Christians he persecuted had taken over his capital city. The Birth of Venus by Botticelli is the most famous painting in the Uffizi, and it was constantly surrounded by a crowd of about twenty people that briefly included me. Adjacent to the Uffizi is the Piazza della Signoria, which is an outdoor gallery containing a mix of original and copied Renesiance and Classical sculpture. The photograph above shows most of the sculptures. I have saved some of them for a later post, and I have already shown one (the fountain of Neptune) in my post about Pluto. The National Museum of the Bargello is not as well known as other attractions in Florence, but it contains some exquisit art. The photography rules changed from one part of the museum to another, so we will begin with my photographs. 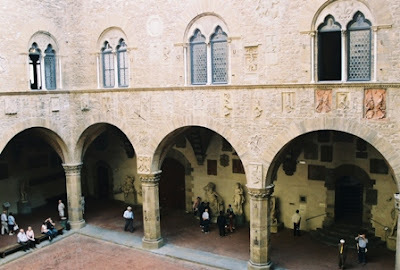 The Bargello is a square building with a central courtyard. 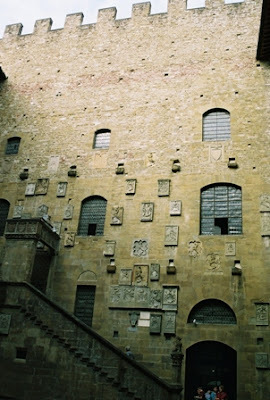 The walls of the courtyard are lined with coats of arms representing many of the ruling factions and families of Florence. A particularly colorful example is shown below. The courtyard also contains some of the museum’s sculptures, including an odd one in the middle arch of the photograph above. It will appear in greater detail in a forthcoming post. 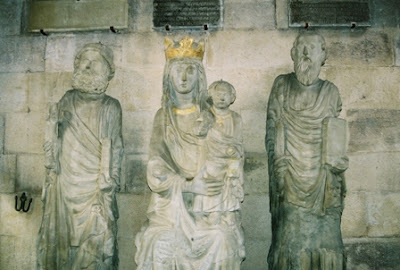 Another sculpture in the courtyard features Mary with a golden crown holding Jesus. She is flanked by two men; I am not sure who they are. I think the one on the right is Moses. One of the features of Renessiance sculpture that repeatedly amazed me was their level of anatomical detail. For example, you can see the veins and tendons in this foot as clearly as you could see them in a live person. Of course, this person is a bit pale, but that is one limitation of working with marble. Despite that, the sculptor made this foot look almost alive. Now we transition from my photographs to those from the web. Above is a photograph of Michelangelo’s Bacchus, who was the Roman god of wine, as you can probably tell by the grapes and goblet. He is missing pieces of his anatomy due to vandalism in centuries past. The Bargello introduced me to the beauty of bronze sculpture. It seems to be better than stone at capturing the curves and softness of human skin and fat. This is Donatello’s David, which is the Bargello’s star attraction. He is depicted here as a child, which may be more Biblically accurate than Michaelangelo’s famous marble rendition. This is one of the most elegant sculptures I have ever seen. I feel obliged to point out that while David declined Saul’s armor, I think he wore something besides a hat and boots when facing Golaith. This is the Ponte Vecchio, a bridge across the Arno River that is a tourist attraction of its own. 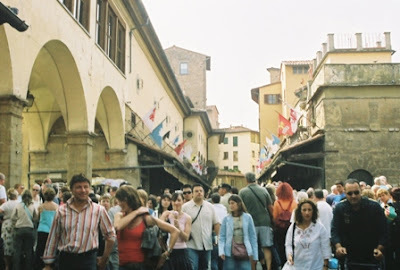 As you can see, a large number of shops are built into and hang off of the bridge. Most of them sell jewelery and gold. 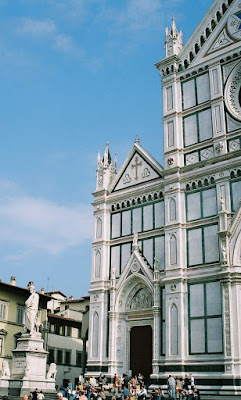 My whirlwind tour of Florence ended when I boarded a bus from Florence back to the Pisa airport to catch the first of three flights that would take me back to California. Before I departed, I placed my own piece of graffiti on the hostel walls. You can see it below accompanied by my signature and date. It is a more complete form of Einstein’s most famous equation. 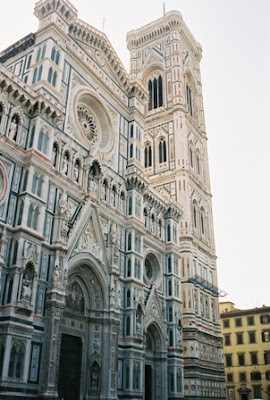 Farewell, Florence; you were beautful, and to God be the glory.